More than 25 years ago, walking down the dirt road to Platis Gialos, I fell in love with Serifos: red soil and schist stones till the sea and in the shadow of the tamarisks, the flavors Nikoulias’ wife, the mother of many smiling daughters and sons had to offer. 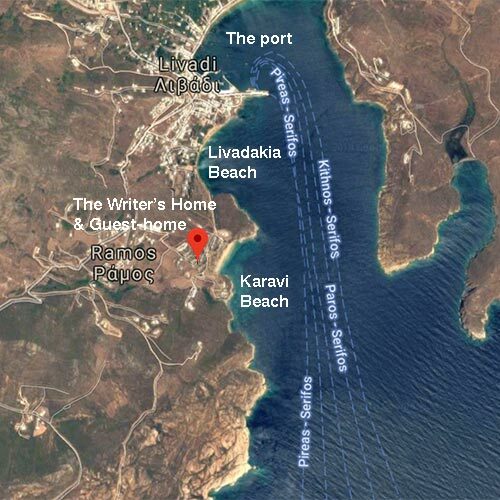 a hot summer’s day noon found me swimming and enchanted in the nook with the green waters down in Vagia; a windy sunday I found shelder in Moustakias’ cook house, in Koutalas and one hot spring saturday I wished to become a fish in Lia beach. The secrets of the place got revealed little by little, as is always the case. Secrets like a sunset in Liomantra, a local fair in St. Giannis Prodromos with the “ktitores”* tending you as if at home; another local fair in St. Thekla with the sky being illuminated by the lightnings and -every year unfailingly- during the fair of Sotiras at Kalo Ampeli with the youth dancing balos -the local dance- and the elders on the violin and on the lute. Moments of happiness on an island that was not blessed with forests and rivers, but with a barren land -hence the island’s official name Serifos- with rocks and iron -hence the appellation, the iron island. How could you know these things when you first arrive: the precious clusters of bοulderstones; or the tradition in metallurgy; or the tiny one-room stone houses that you still see scattered onto the plateaus or conveniently positioned in the furrows, that are called cells and they were the rooms where the miners spent their nights. A wandering in a place like this wonderful island which I made my land, needs you to be ready as long prepared and open to encounters, a flâneur, as Charles Baudelaire calls it, a wanderer, a promenader, a traveler. And then you might be the lucky one who will taste grandma Sevasti’s caper, the local homemade wine or the cheese that nestles down in the ground with herbs until it reaches your palate, a full moon in August or a night with stars that you think you can touch them if you just extend your arms. Gifts of a rock in the Aegean that will offer themselves to you if as long as you stay there, you find something from yourself to give back. “My darling Serifos” was written for the municipality’s book, Serifos Greece, published 2012.